6; OL #6. OA #6; streets & bldg 4-42. Description Same as 1537a but cropped differently. [Written in ink on front]: Where Ferguson's Furniture is located now. [111 A st.] Signs on building: Bath House; Bon Ton Confectinery; C.N. 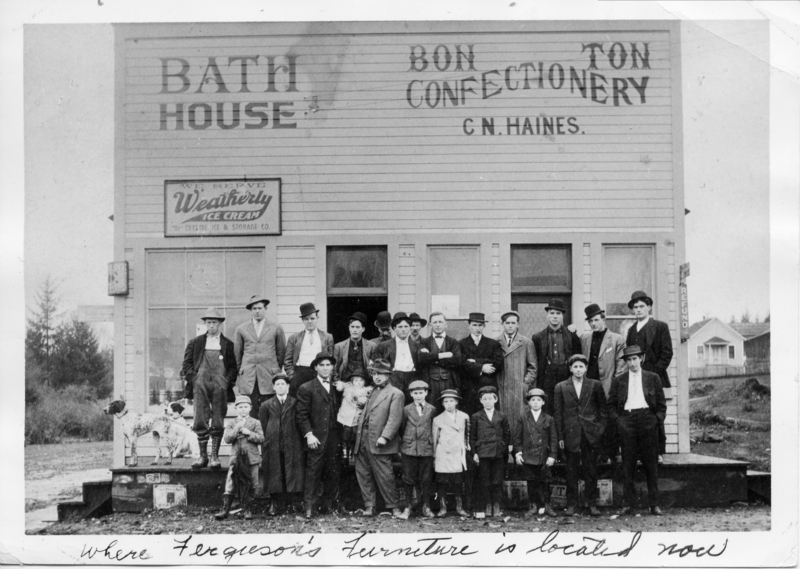 Haines; We serve Weatherly ice cream, Crystal Ice & Storage co.; Oregonian; refund. Caption from Iron, Wood, & Water: ""...Charles N. Haines, the man in the center without a hat, stood in front of his business on the corner of First & A...""
Transcription 6; OL #6. OA #6; streets & bldg 4-42.